Why Exhibit at a Trade Show or Exhibition? If done well, exhibiting can offer so many rich opportunities. So it is vital to get it right and take full advantage of your time at the event. The motivation to exhibit will depend a little on whether it’s a trade show or a public exhibition. Either way, you need to think about the “why” of it. There are numerous reasons for a company to exhibit, so before investing time and money make sure clear objectives are set. The reasons for attending an exhibition will have a dramatic effect on the exhibition stand size, design, layout, position within the hall and final budget. Increase your reach to your customers and raise market awareness. Add yourselves to the radar of potential future customers. No other form of marketing offers the same experience as exhibiting. Your exhibition stand is effectively your shop floor, and you have the visitor’s full attention. It’s your chance to make a big impression on hundreds, if not thousands of potential clients, and demonstrate or sell your products in a live environment. It’s a chance for them to touch fee, see and play with them! It is much easier to build a relationship face to face than it is over the phone or by email. Every one of us grew up with our main form of communication being face to face; this is what helped us to thrive and become the people we are today. Use these skills to communicate with your visitors with a view to selling or demonstrating your products and finding new distributors or suppliers. One of the most common reasons for exhibiting is to raise awareness of a new product launch. This exciting time for your company can be relayed to the potential customer through product demonstrations, and is also your chance to give your sales pitch and generate media interest. At an exhibition you can obtain leads which are of much higher quality than anywhere else. You are amongst people who are attending that specific show because they are interested or involved in the industry you work in. Key decision makers will be visiting your stand and will be in a buying mode. The leads generated allow you to build your potential client database for future communications including follow ups, feedback and marketing research. Use this opportunity to take a walk around the exhibition and find out what your competitors are offering. How does their stand look? How many people are manning their stand? Are they using any techniques or special offers to get visitors to approach their stand? In other words what are they doing better! Ok, if your first exhibition did not go quite as planned, you can always learn from this experience and make preparations to make future exhibitions more successful. 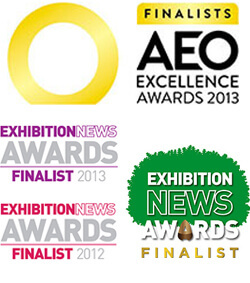 Win – by maximising your ROI and exhibition success. But if you want help or guidance through any of these processes, then just pick up the phone and speak to one of our specialist today.